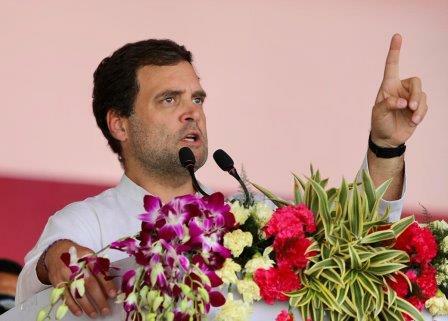 Bhawanipatna: Congress president Rahul Gandhi on Wednesday launched a scathing attack on both Naveen Patnaik-led BJD government and Narendra Modi-led BJP government at the Centre accusing them of snatching tribal land in the state. He assured that his party will work for protecting the rights of the community. “Naveen Patnaik and BJP are trying to take away the land of tribals. But, We will protect your rights on water, land and forest,” said Gandhi at a rally at Bhawanipatna. “Congress has always given special treatment to the KBK region. The Government should give special attention to the KBK districts for development of people in this region. But both Modi and Naveen Governments have only neglected the people here,” he added. Gandhi alleged that the BJP and BJD are working for the benefit of their industrialist friends. “While Naveen Patnaik gave you corruption and chit fund scam, Modi gave Rafale scam to the country. Modi looted money from you in the name of demonetisation and gave it to Nirav Modi, Vijay Mallya and Anil Ambani,” said Rahul.